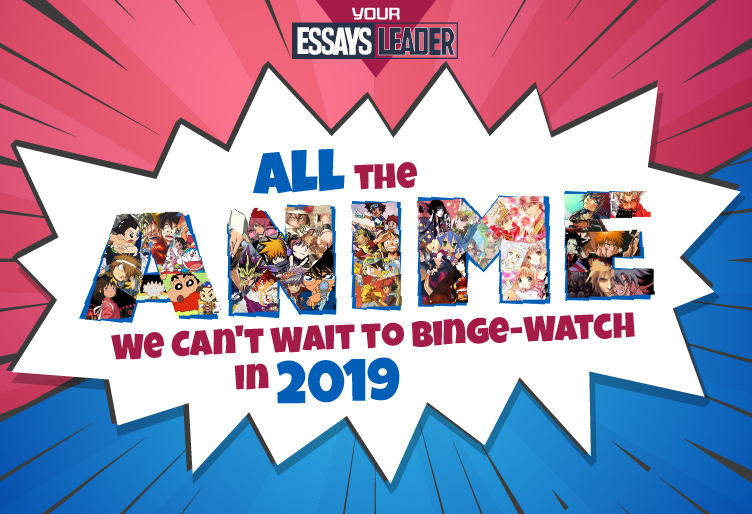 Fans of Japanese animation are looking forward to the new 2019 anime. Here is a list of the best TV shows and full-length pictures that are worth seeing this year. In January 2019, the release of the original anime series, which tells about the adventures of five schoolchildren led by Daisuke Dojima, is expected. They were suddenly carried 300 years forward in time, where they would have to fight against an unknown enemy in order to regain their present. Fans of cyberpunk and anime series Psycho-Pass are waiting for three full-length films, united by the common name Psycho-Pass: Sinners of the System. The first part of Psycho-Pass: Crime and Punishment will be released in January 2019 and will be devoted to Nobuchika Ginoza and Mika Shimotsuki. The Shogakukan announced the release of an anime adaptation of the manga Shimizu Eiichi for the 2019 year. This is a story about Lyceum student Shinjiro Hayata, who learns that his father was the first Ultraman to defend humanity from alien invaders. Now the teenager seeks to follow his father. One day he will try on a unique costume. This anime was created after Kengan Asura fighting manga. This is a story about a kind of gladiatorial battles, which have been held by wealthy businessmen in Japan since the Edo era. Tokita Ohma, nicknamed Asura, is one of the participants in such battles, who is famous for his ability to crush opponents. His skills attract the attention of many businessmen, including Hideki-Nogi, the president of the “Nogi” group of companies. This is the story in which the young Japanese have to save the whole world. Itsuka Shido is a specialist in taming spirits. In the third season of the series, his work will obviously increase: so many spirits (mostly female) will arrive on Earth, that the guy will have to forget about his personal life and immerse himself in the fight against uninvited guests. Strange changes begin in the elite Japanese Academy with the advent of a new student. Changes occur in the lives of local students – people from wealthy families. Moreover, at the same time, they change the school, which suddenly finds itself at the mercy of gambling. Many things start to depend on the cards, including the lives of people connected with the academy. This story takes place in the fairy world. All roles are strictly distributed and are written down to the smallest details in advance. However, some characters suddenly decide to change their fabulous fate dramatically. The series tells about the friendship of two young pianists, who will have to endure the test of a great music competition. During the prestigious contest, these two friends will become the main rivals, and the confrontation between them will be serious. The series begins with the fact that a high school student finds a soft toy on the way to school. It is a supernatural being that is ready to serve its new master. Moreover, all attempts to get rid of the new “pet” do not give results: the young man has to seek help from an exorcist, the sullen Mononoke. Japan is threatened by mysterious flying creatures. In order to counter the unknown forces, the country is rapidly taking up the creation of its own air defense technology. Among the developments, there are models of aircraft in the guise of pretty girls, able to effectively resist the enemy. The story takes place in a Japanese town shocked by a series of mystical murders. Similar things happened here before. However, this time everything turns out to be much more serious: the settlement is quickly filled with dangerous creatures (from monsters to ghosts); the dark sides of the human soul of the locals break out along with them. Rikka lives in a ninja estate, safely sheltered from prying eyes in a quiet corner of a futuristic city. She is the eldest daughter and heiress of her clan, but she is more attracted by the path of her father, a scientist. She loves and respects him very much. The girl’s normal life ends when once a sudden attack is made on her house, and now Rikka must overcome the unexpected crisis on her own. The release date of the animated series is scheduled for February 2019. However, it is rumored that the premiere could take place much later, in August. This TV show with a rating of 17+ will continue the story of Wei Wuxian, who once stepped on the dark side, and his sworn enemy Wangji Lan. In the new season, they will continue to work together on the extermination of monsters. However, can it finally reconcile them? The continuation of a story of a caterpillar named Boro will delight fans of Hayao Miyazaki’s creativity, who was about to finish his career. The new season will give us the continuation of a good story about the caterpillar living in the city and its journey in search of a new home. The release date has not yet been fixed. The release date for the continuation is set for mid-2019. The plot of the animated series continues to talk about the performer named Haruka. In the new season, she will have to contend with the growing number of competitors and her feelings. Fans will enjoy a selection of good audio and intriguing plot twists. The new season of the popular cartoon series is expected in April 2019. The story, as before, develops around the protagonist Soma Yukihira, who is studying at the school of cooks and is striving to become a great culinary specialist, like his father. In the new season, Soma will continue to participate in the culinary competitions and will be tested for strength with his friends. The plot develops around the superhero Saitama, endowed with superhuman strength. After being bored with the same type of battles with unequal rivals, he is in search of an equal opponent. A supervillain will appear in the series and will demonstratively ask for a fight with Saitama. The release date is announced in the spring of 2019. This TV show will tell the story of Naofumi Iwatani, who was called to become a hero and protector, but foolishly he was robbed and charged with a crime. He was called the weakest of heroes and left alone. Will Naofumi be able to cope with the desire to take revenge? The expected release date is January 2019. The release date of the new season is scheduled for July 2019. The story continues to evolve around the protagonist named Kogarashi, who from childhood has been endowed with the ability to see ghosts. He meets a cute, funny ghost, Yuna. Will they be able to solve the unfinished case of a 16-year-old girl together? Will she succumb to the pressure of evil forces and turn into an evil ghost? The plot promises to be interesting. This is a romantic story about orphan Tohru Honda, on the way of whom a mysterious, magical family appears. The girl is immersed in the secrets of a foreign family. The plot is based on the famous manga, has passed the reboot and will look much more interesting and modern. The main character is a surfer. One day, she is noticed by a rescue guy, a fireman, in whose heart a fire flashes at the sight of a pretty surfer. Romantic relations are established between them. This anime will be released in 2019 and will affect the subject of the future. In Japan, a new calendar and a new era should begin. Emperor Akihito must hand over the throne to his son. The animated film of Tomohiko Ito in which fiction is combined with romance is dedicated to this event. Many fans of the genre consider this anime mandatory to view. The Makoto Shinkai project is dedicated to love and shows the story of the feelings of the main characters. The center of attention is a lonely young man and a girl who has an unusual gift. She can control the weather. This is a beautiful story, developing against the background of the sky, clouds and weather surprises. The story of wizards who live in the shadows, hiding their abilities, is among the most anticipated anime of 2019. One day, the magical world fails, and all who previously were hidden from human eyes are forced to go outside. Life around will change drastically now. It is one of the best new anime.